The book is focused on the 3.1 version of Solr. The content is divided into ten thematic chapters, each of which consists of a few to several subsections. 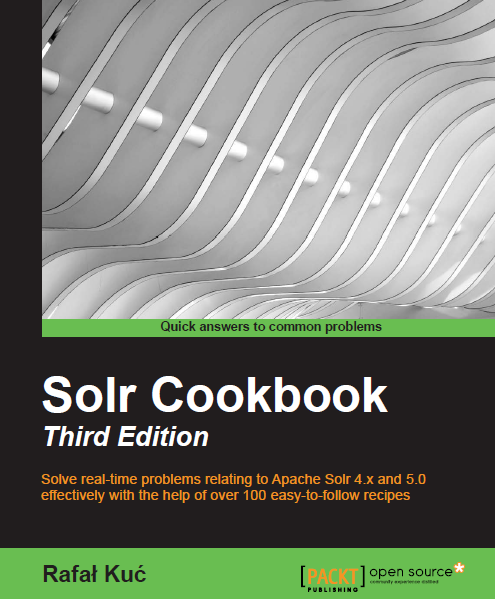 The book is maintained in the convention cookbook which means that it is not a guide from A to Z about Solr – it is a ready-made solutions to some of the problems that can be encountered while working with Solr. If you are interested, please refer to the Packt Publishing page: http://www.packtpub.com/solr-3-1-enterprise-search-server-cookbook/book. We would look to ensure that the reception of the book should be as good as possible and because we have found some mistakes in the book we decided to write a little errata. We sincerely apologize for all the error and mistakes. Please ignore the additional $ character. Page 32 of the book contain additional sentence which should be there: “There is one more thing before you can run the IndexSorter tool“. Please ignore that sentence.